Lankaran, one of the most picturesque corners of Azerbaijan distinguished from other cities by its excellent climate and unforgettable delicacies, holds an amazing tea, paddy, and citrus fruits festival. At the festival held at the Heydar Aliyev Memorial Park and organized by the Lankaran City Executive Power, the delicacies of the city are being exhibited in the pavilions such as "Our tea has a name", "Lankarani sweets - our taste", "We gather beauty drop by drop", "Build new Lankaran", "Who wants to live in paradise, come to Lankaran" and other. Participants of the festival have the opportunity to get acquainted with the varieties of tea in Lankaran, learn how to breed the true natural tea, taste dishes made of more than 50 varieties of rice such as "Hashimi", "Sadri", "Campo", as well as other delicious dishes of Lankaran cuisine - poultry and fish dishes. Other products produced in Lankaran and folk art samples are exhibited at the pavilions opened along the park. A concert with famous masters’ performance will be held at the end of the festival. If you ask an Azerbaijani about the most fruitful region of his country, he/she will probably name Lankaran. 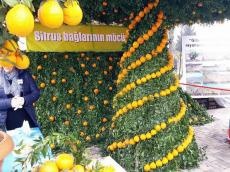 The agriculture of the region is mostly known for its citrus and subtropical fruit-growing, and it is no coincidence that Lankaran is called the land of citrus plants, such as oranges, tangerines, lemons, and others. True miracles of nature are waiting for everyone who will visit this part of Azerbaijan. Most people would think: what is unusual about the bushes of tea? This is how many of the guests of the country think until they step on the ground of Lankaran and see the endless plantations of tea bushes. Tea plantations in the valleys of Lankaran await guests who can enjoy the magnificent scenery, the beauty of the mountains and valleys, the cordiality and hospitality of the locals. And be sure to taste Azerbaijani tea, which will give cheerfulness and health. Lankaran is still famous for its paddy production. The fragrant Lankaran rice has been the most valuable food for locals for centuries. Rice products of ‘Sadri’, ‘Anbarbu’, ‘Hashemi’, ‘Hasani’, ‘Akulya’ and other sorts of rice are distinguished with their aroma, taste and abundance.